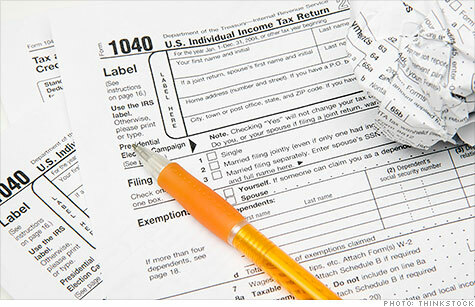 Of the 400 highest income tax filers in 2009, a handful ended up owing nothing in federal income taxes to Uncle Sam, despite belonging to a group with an average income over $200 million. NEW YORK (CNNMoney) -- It's a statistical blip, but a stunning one. In 2009, six tax filers among the country's 400 richest tax filers owed absolutely nothing in federal income taxes. This, despite the fact that those six filers belong to a group whose average adjusted gross income clocked in at $202.4 million, according to new IRS data. Now, it's not news that close to half of the more than 140 million U.S. tax filers end up with no federal income tax liability. Nor is it news that a sliver of those non-payers make seriously big bucks. But it's eye-opening when anyone among the 400 highest income tax filers is among them. As a group, of course, high-income households pay more into federal coffers than the vast majority of Americans combined, and their effective tax rates are often higher than what most Americans pay. So how is it that a lucky few can wind up owing nothing at all? Without being able to examine the returns, which are confidential, no one can say with certainty how those six filers in the top 400 did it in 2009. "Each return is a different story," said Edward Kleinbard, former chief of staff at the nonpartisan congressional Joint Committee on Taxation. But the likely reason is straightforward. "It's because the tax code allows them to do it," said tax lawyer Christopher Bergin, president and publisher of Tax Analysts. In particular, the foreign tax credit and the deduction for charitable contributions may have played big roles, Kleinbard said. The very wealthy often invest in foreign businesses and other non-U.S. investments. If they pay tax on those investments to foreign governments, they can take a credit on their U.S. return for those payments to avoid double taxation. Similarly, the richest of the rich also are well positioned to give away large amounts of money. Charitable contributions let a wealthy donor contribute to the social good while substantially dialing down his tax liability. And it's possible a number of other itemized deductions -- such as those for state and local taxes paid -- helped as well. For Bergin, the phenomenon of uber-rich non-payers is yet another good argument for Congress to reform the tax code. Tax experts would prefer that policymakers greatly reduce the number of tax breaks available and, if affordable, reduce income tax rates as well. Under that kind of regime -- which is easier to propose than pass -- taxpayers would have fewer opportunities to shelter money and therefore would have less reason to make financial or economic decisions based on the tax consequences. But since one goal of reform is to simplify the tax system, lawmakers should avoid drafting special rules designed to ensure that there are no non-payers above a certain level. "It may be a way to do tax politics, but it's a horrible way to do tax policy," Bergin said. The AMT was created in 1969 when it was discovered that 155 wealthy tax filers ended up owing nothing in federal income taxes because they took advantage of the legal tax breaks available at the time. The goal was to ensure the wealthy paid at least a minimum amount of tax. But in subsequent years the AMT was "repurposed into a mass-market product," Kleinbard said. The result? Instead of guaranteeing that the rich pay at least something, the AMT now threatens to engulf tens of millions of non-wealthy filers unless lawmakers pass a costly "patch" every year to protect them.